A 130-year-old play is under attack for including racial caricatures and failing to include any Asian American actors in its latest iteration by an amateur Seattle theater group. 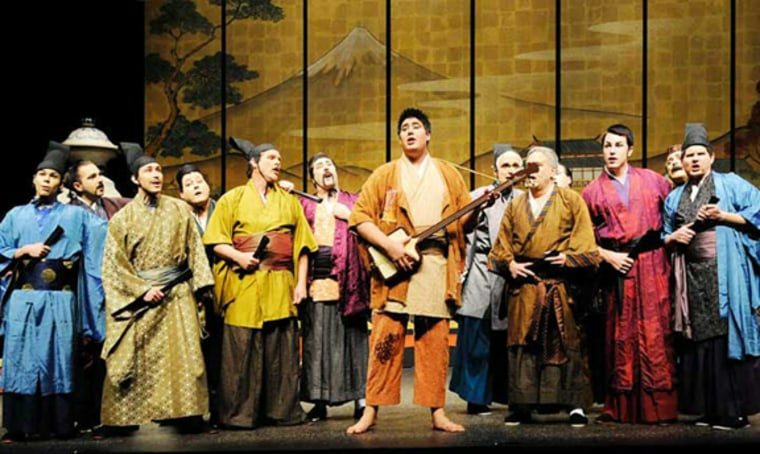 The Seattle Gilbert and Sullivan Society chose "The Mikado" -- a comic opera written in 1885 -- for the tenth time in the society's 60-year history. "The Mikado" was written as a critique of British politics and institutions, set in distant, mysterious and mostly made-up Japan -- a place that few in Gilbert and Sullivan’s 19th century British audience knew much about -- to mask that criticism with exaggerated, sing-song names and simplistic Orientalist stereotypes. But in 21st-century Seattle, where Asian Americans are the second largest racial group (14%) and people of color make up 34% of the population, the show's producers are now under fire for selecting a play that critics say relies heavily on ethnic caricatures, and then casting all 40 Asian roles with White actors, with the exception of two Latino actors. "It’s yellowface, in your face," wrote Seattle Times' Sharon Pian Chan, referring to the practice of Caucasian actors dressing in stereotypical Asian costumes and makeup with overwrought mannerisms. “The caricature of Japanese people as strange and barbarous was used to justify the internment of Japanese Americans during World War II...'The Mikado' opens old wounds and resurrects pejorative stereotypes." "It's astounding we have to keep relitigating this"
Seattle show producer Mike Storie notes Chan had not even seen the show she wrote about. "I have no problem with the ideas expressed in the column that appeared in the Times. She has a right to her opinion, however I wish she had researched it a bit more," said Storie. "We never use makeup of the description she used and if she is using the phrase to mean one ethnic group pretending to be another on stage, her wording, unfortunately brought out only a few reasonable responses and a lot vitriolic ones. Our phone mail and e-mail boxes have been full of hate from people who have no idea of who we are or what we do." He also pointed out that the show can only cast people who audition. "We send out audition announcements early each year along with the musical and dramatic requirements for each part in the upcoming show. We typically get 60-80 people auditioning each spring and the sole selection criteria is the person’s talents for singing, acting and stage movement," Storie said. "If a person of any color shows up to audition, he or she has a fair shot of getting into the show if they have the talent. And the competition is pretty fierce." Seattle's Gilbert and Sullivan Society isn't the first to take on 'The Mikado' in modern times, but it's not also not the first to spark this sort of controversy. Performances around the country have drawn criticism and protests in recent years, including in New York (2004), Los Angeles (2007 and 2009), Boston (2007), Austin (2011), and Denver (2013). "Our phone mail and e-mail boxes have been full of hate from people who have no idea of who we are or what we do"
Storie said he was first aware there had been previous protests about 15 years ago. "There were some student demonstrations [in California] at the time," said Storie. "According to one of our members who drove a truck with the set to the [the International Gilbert & Sullivan] Festival, most of the demonstrators were not familiar with the show." Other theater companies, including some Asian American theatre companies, have re-imagined the Mikado in alternate fantastical settings. Ken Narasaki and Doris Baizley wrote The Mikado Project (now a film by Chil Kong) about a struggling Asian-American theater company trying to stage an updated Mikado. Mu Performing Arts in Minneapolis dressed their all-Asian-American cast in 19th century British clothes. Actor Greg Watanabe is based in Seattle, and calls the Society's decision to produce the play in 2014 "willfully ignorant." "It's astounding we have to keep relitigating this," said Watanabe. "The galling part is, the producer is aware there are racist elements and yet doesn't think it's relevant, isn't aware that people are offended and have a problem with it, or doesn't care, and then thinks casting no Asians in it is also totally fine." Similar criticisms have been posted on the company's Facebook page, and Yelp review page, calling the play "offensive," "insulting," and "demeaning." Local radio host, Dave Ross, who plays "Ko-Ko" in the Seattle production, defended the play in an interview, responding to Chan's column about the use of "yellowface" with, "People are wearing pink makeup. I don't know where the yellow comes from." Ross then hosted Chan on his show for a longer discussion. "I will admit," said Ross. "It's new to me that it's racist for a Western person to dress in a Japanese kimono." "Even if it's been done for 100 years doesn't mean that racial caricature isn't there," replied Chan. "And just because you don't see it, doesn't mean it's not there either, Dave." "Right, but just because you see it doesn't mean it is there," said Ross. "That's the problem here." At the end of the 12-minute discussion, Ross concluded with a pledge to take audience response into account. "If it's true that every Asian American who's seen this show has been offended by it, then I need to know that," said Ross. "And if that's certainly true, then it needs to be changed." The play is scheduled for performances July 11th-26th.